Thirsty Pilgrim: ZBF Weekend is Growing Into a Liver-Eating Belgian Beer Week Monster. And I'm Cool With That. ZBF Weekend is Growing Into a Liver-Eating Belgian Beer Week Monster. And I'm Cool With That. Its all built around the Zythos Beer Festival in Sint-Niklaas. More on that event later, which attracts plenty of traveling beer geeks. That makes it a good time for other places that like traveling beer geeks to organize to-dos. For now, it starts Thursday, March 4, with the Pre-ZBF Festival at Lakebosschen castle in Oostkamp, not too far from Bruges. Click on that link to find a PDF with all details in English. 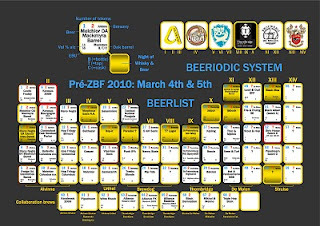 (Note the excellent "beeriodic system" that represents the fest's beer list.) Organized chiefly by the Alvinne picobrewery, last year's success follows with beers from Alvinne, Struise and Urthel, Dutch brewery De Molen, plus British breweries Thornbridge and Brewdog. No doubt there will be other surprises. The Thursday Pre-ZBF event is a "whisky and beer" experience from 5 p.m. to 10 p.m. Don't bother, it's already sold out. Friday is open to the wider public, though, with or without reservation, from 10 a.m. to 8 p.m.
Saturday is not just when ZBF starts. It's also Cantillon's semiannual Public Brewing Day. For those planning to hit ZBF later that day, what better way to start than coffee and croissants with the smell of cereals wafting through the air at Cantillon, bright and early? For the rest of the weekend you've got to options: go two ZBF or drown yourself in Cantillon (and about 30 other top draft beers) at Moeder Lambic Fontainas. Or both. Hard to go wrong, no matter which path you take. Now if they would only move all these events into a nicer month like May or even April, with warmer weather and more daylight, I would certainly make the trip more regularly. Thinking about heading up to the pre-event to try and get my hands on some Tactical Nuclear Penguin. I wish I had found out about this blog before tonight as I have lived in Belgium for 3 years now.